Following the LA premiere, Daisy Ridley jetted off to London for the premiere of 'Star Wars: The Last Jedi' at the Royal Albert Hall yesterday evening(December 12th). 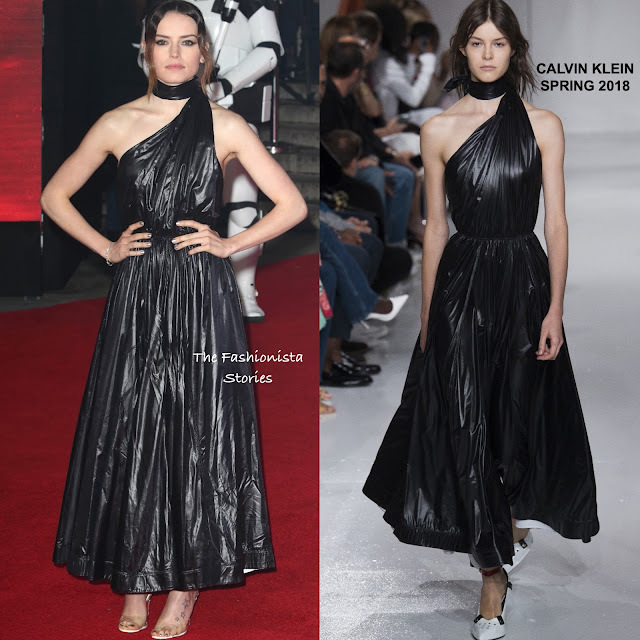 She hit the red carpet in a CALVIN KLEIN FALL 2018 black pleated leather one-shoulder which stopped just above her ankles and featured a tie neck detail and a gathered waist. Beauty wise, she complimented her look with a up-do & wavy tendrils and a smokey eye. She finished up her look with CHRISTIAN LOUBOUTIN sandals and TIFFANY & CO jewelry. What do you think of Daisy's look? Tags: Calvin Klein, Christian Louboutin, Daisy Ridley, fashion, Tiffany and Co.